A higher education institution is the focal point for imparting what is known, interrogating what is not, producing new knowledge, shaping critical thinkers, problem solvers and doers in order to tackle societal challenges at every level necessary, and advancing civilization. That role renders these institutions a key building block of our societies. For higher institutions to run all these errands parallel with teaching, conducting research is mandatory. Research-based education has lately received increasing interest in higher education. The impact of research on institutional cultures, competence, and practices that affect teaching quality is undoubted. Students receive significant benefits from staff research in that they are provided with the capacity for academic thinking, and skills in doing research. Ethiopia’s higher education institutions centered on teaching for decades; researches conducted during those years were mostly for the sake of fulfilling academic requirements and remained paper valued. Without conducting and promoting researches, neither can an academic institution sustain its competitive edge for long, nor can academicians specialize on a topic. Research and experimental development is a must for creativity and to increase the stock of knowledge, including knowledge of man, society, and the use of this stock of knowledge to devise new applications which can be commercialized and ultimately contribute in problem solving and economic development. Imported modern techniques and technologies cannot be the ultimate solutions to the problems plaguing our country as we may not afford them or they may require a previous infrastructural technology already in place to be adopted in the first place. We have to develop technology that is economically feasible, culturally accepted and practically applicable for us. Addis Ababa University, the pioneer educational institution in Ethiopia has deviated its focus now towards demand driven and problem solving adaptive researches. In 2012, the university launched thematic research in 26 different areas under the backing of the Office of the Vice President for Research and Technology Transfer. This strategy set out to support problem solving research and uphold the economic endeavors of the country. In addition to its advantage in terms of solving problems and contribution for economic development, thematic research is intended to build research capacity of graduate students as inclusion of M.A. and Ph.D. programs. The other interesting feature of the thematic research is enhancing cooperative work; it creates an opportunity for scholars to undertake group investigation, knowledge share and cooperative learning. The Office of the Vice President for Research and Technology Transfer, AAU is mandated to approve the thematic research proposal, provide grant, follow up its progress, and publicizes the findings of these researches through an annual workshop it organizes, publishing them on international reputable journals and on national mass media. 5000,000 EB grant is offered for each thematic research for duration of three years. Research must always be of high quality in order to produce knowledge that is applicable outside of the research setting with implications that go beyond the group that has participated in the research. Furthermore, the results of the study should have implications for policy. The efforts made so far towards enhancing demand driven researches in Addis Ababa University are promising to step the country’s vision forward. One of the research results obtained through the investigation made during the first round of the thematic research was an enzyme used in leather tanning industry. The leather tanning industry throughout the world uses enzymes for the bating stage of leather tanning with most enzymes used for this application obtained from micro-organisms. Currently, Ethiopia imports bating enzymes from abroad for a substantial amount of foreign currency. The thematic research finding in the laboratory of the Institute of Biotechnology of the AAU is supposed to resolve this master problem and minimize foreign currency expenses. The researchers identified different micro-organisms producing enzymes that are potentially useful for bating in the leather tanning industry. Cheaper enzyme production processes have also been developed and the enzymes harvested and stored in the powder form that the commercial enzymes come in. Three of these enzymes were then tested for bating leather at actual application conditions and their performances were compared with two commonly used commercial enzymes. The result showed that their performance is much better than the commercial enzymes. This indicates that if these enzymes are produced in large scale, they can replace imported enzymes for local use and in the long term can compete in the international market. In recent years, scientists have also found very interesting applications for enzymes in the dehairing (hair removal) and soaking stages of the leather tanning process. Traditionally, dehairing of skin or hide is carried out through the application of sodium sulfide and lime. This stage, however, marks the largest source of environmental pollution in the tanning process, for which the leather industry is wildly infamous. The use of enzymes, on the other hand, greatly reduces or completely avoids the use of sulfide, rendering the process much cleaner. In the same laboratory, another enzyme has been developed that can efficiently remove hair without any addition of sulfide and lime. This shows that large-scale application of this enzyme, in addition to reducing import of expensive dehairing chemicals, could also lead to a significant reduction in the level of environmental pollution. The enzyme can also be used for soaking, allowing increase in processing capacity without investing on additional infrastructure. The use of multiple data sets such as morphological, biochemical and molecular in combination with appropriate statistical methods is essential to identify inter and intra-species’ variation to develop improved cultivars. To this fact, intensive field evaluation has been carried out under stress and non stress environmental conditions. A Simple Sequence Repeat (SSR) diversity analysis of 105 finger millet germ plasms collected from Ethiopia, 39 introduced accessions from eastern and southeastern Africa and six improved varieties resulted in the selection of 30 diverse and best performing genotypes for further evaluation at multi-locations. 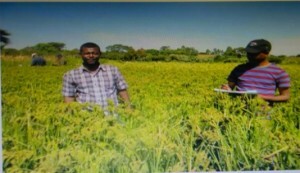 Accordingly, those 30 advanced finger millet genotypes were evaluated against two standard checks across four locations (Arsi Negele, Assosa, Bako and Gute) in the 2012 and 2013 growing seasons. 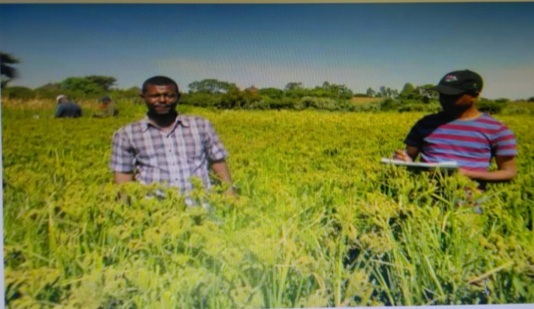 Overall, three high yielding candidate finger millet varieties with a higher yield over the best standard check have been identified for future use by local farmers. Three other promising genotypes have also been identified for drought tolerance. Moreover, the three candidate varieties have moderately shown resistance to disease reaction. Additive Main Effect and Multiplicative Interaction (AMMI), GGI biplot analysis and Eberhart and Russell models revealed that “Addis-01” was stable and high yielding (3.16 ton ha-1) with a yield advantage of 13.7% over the best standard check, and thus officially released and recommended for production in the test environments and similar agro-ecologies in Ethiopia. Seeds of the released cultivar “Addis-01” have been disseminated during the 2015 main growing season to small holder finger millet farmers around Arsi Negelle area of the Rift valley and Gute, Kamashi and Bamabasi woredas of western Ethiopia. The research was led by the Institute of Biotechnology (IoB) of the AAU with financial support from Bio-innovate Africa and in partnership with Bako, Assosa and Melkassa Agricultural Research centers.